We’ve served our incredibly flavoursome lamb and aubergine stew on top of a smooth, creamy houmous in this mezze-style dish. Paying tribute to the Mediterranean, it’s best scooped up with still-warm flatbreads. Heat a splash of oil in a large, deep frying pan with a tight-fitting lid and fry the lamb, in batches, over a high heat until browned. Remove with a slotted spoon and set aside on a plate. In the same pan, fry the aubergine in batches, adding a little more oil if needed, until golden and just cooked through. Remove with a slotted spoon and set aside on another plate. Reduce the heat and cook the onion until softened (about 10 minutes). Stir in the figs, garlic and spices, then cook for 2 minutes until fragrant. Return the lamb to the pan, stirring to coat well in the spices, then pour over the hot stock. Bring to a boil over a high heat, then reduce the heat and simmer, covered, for 1½ hours or until the lamb is very tender. For the last 10 minutes of so of the cooking time, stir in most of the aubergines and 75g of the olives, leaving off the lid so the sauce has a chance to thicken. Taste and season the stew with salt and black pepper (be mindful that the houmous and olives will add a little saltiness). Meanwhile, make the houmous. In a food processor or mini chopper, pulse together the chickpeas, garlic, tahini and lemon juice until smooth. With the processor running, pour in the olive oil in a steady stream along with the ice-cold water until the houmous is very smooth. Taste and season with salt, freshly ground black pepper and more lemon. 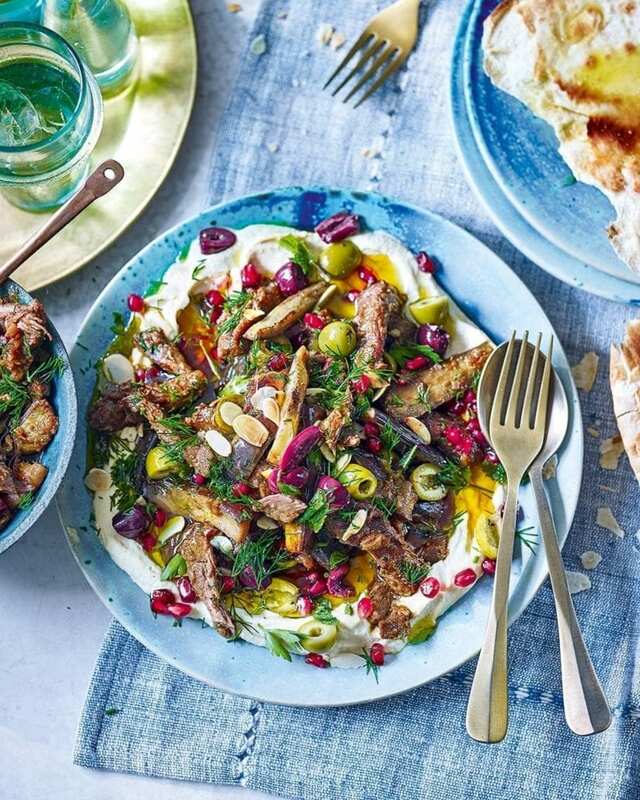 Spread the houmous over the base of a large serving dish and spoon over the hot lamb and aubergine stew, top with the remaining aubergine and olives, then scatter over the almonds, herbs and pomegranate seeds. Serve the stew with flatbreads for scooping. Make the stew to the end of step 4, then cool and keep in an airtight container in the fridge for up to 2 days. Reheat thoroughly to serve. Or freeze the stew in an airtight container or bag for up to 3 months. The houmous will keep for up to 24 hours, covered, in the fridge. Bring to room temperature to serve. Baharat (meaning spices in Arabic) is an aromatic, warm spice mix made up of black peppercorns, coriander seeds, cinnamon, cloves, allspice, cumin, cardamom and nutmeg (no two recipes are the same). Juicy, bright and ripe New World reds hit the mark here, especially Aussie or Chilean merlots.